(Nanowerk News) Microscopically tiny ferromagnetic platelets exhibit a phenomenon which could be exploited in the future for particularly stable magnetic data storage: so-called magnetic vortex cores. These are needle-shaped magnetic structures measuring 20 nanometres in diameter. Five years ago, researchers at the Max Planck Institute for Intelligent Systems (formerly the Max Planck Institute for Metals Research) in Stuttgart found a way to reverse the magnetic field needles despite their stability using only a tiny amount of energy so that their tips pointed in the opposite direction. Such a switching process is necessary to enable the vortex cores to be used in data processing. The Stuttgart scientists have now discovered a new mechanism which makes this switching process at least 20 times faster and confines it to a far smaller region than before ("Magnetic vortex core reversal by excitation of spin waves"). Magnetic vortex cores could thus provide a means of data storage which is stable, fast and greatly miniaturized. An edge length of a mere thousandth of a millimetre and a thickness of a few millionths of a millimetre: these are the tiny dimensions of the platelets which the researchers in Hermann Stoll's group at the Max Planck Institute for Intelligent Systems in Stuttgart are investigating. They are made from Permalloy, an alloy of nickel and iron, and their shape ensures the formation of an ordered magnetic structure. The arrangement resembles a shooting target: like tiny compass needles the magnetic moments of the atoms in the plane of the platelet form concentric circles, so-called vortices. This circular arrangement changes in the centre of the platelet. "Imagine you were to form concentric circles using matches," explains Hermann Stoll. "You cannot do this in the centre of the circle because the matchsticks are too long. You then have to turn them out of the plane so that they form a needle which stands perpendicular to the plane". Something similar happens in the vortex platelets: a kind of magnetic field needle forms, which juts out of the plane, the so-called vortex core, with a diameter of a mere 20 nanometres. Since it can point either upwards or downwards, it can be used to store bits of information. The polarity of the vortex core can be switched by means of a magnetic field acting from the outside; this field must be very strong, however, around half a Tesla. This roughly corresponds to one third of the field that the strongest permanent magnet can supply. It has the advantage that magnetic storage of this type would be stable against interfering magnetic fields. This stability also turns into a disadvantage, however, because it makes it more difficult to reverse the vortex core and thus process data. There are ingenious mechanisms, however, which make it possible to switch the vortex core with smaller magnetic fields without losing the magnetic stability. Five years ago, the Stuttgart researchers working with colleagues at the University of Gent, the Advanced Light Source in Berkeley, California, the Jülich Research Center and the Universities of Regensburg and Bielefeld, found a way of dynamically switching the vortex core with a magnetic field pulse which is 300 times weaker. The scientists observed this previously unknown mechanism using so-called time-resolved magnetic scanning X-ray microscopy, which was developed at the Stuttgart Max Planck Institute and carried out at the Advanced Light Source in Berkeley. Since then, the department Schütz at the Max Planck Institute for Intelligent Systems has worked in close collaboration with the Helmholtz Zentrum at BESSY II in Berlin on developing a new type of scanning X-ray microscope. The Stuttgart physicists, together with researchers from the Universities of Gent and Regensburg, have now discovered a further mechanism which can be used to switch a vortex core at least 20 times faster than was previously the case, i.e. within around 200 picoseconds; it involves the researchers applying a magnetic field pulse in the gigahertz range. Five years ago they used a pulse in the megahertz range and the switching took four nanoseconds. 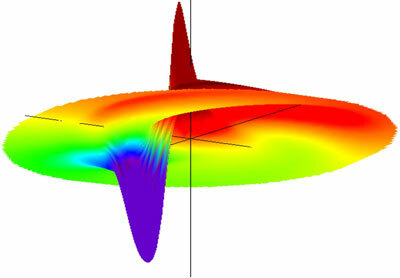 The newly discovered mechanism generates so-called spin waves, i.e. fluctuations in the magnetization of the material which propagate like waves. As the team of scientists found out, these excitations are able to switch the vortex core. The group of researchers also succeeded in describing the theory of this phenomenon. "We can predict that it is possible to decrease the switch-over time by a further factor of 10," says Hermann Stoll. If the aim is to use a vortex core as a storage bit, the effect now observed has a further advantage in addition to its higher switching speed. The vortex core remains almost stationary when the switching is done with spin waves. 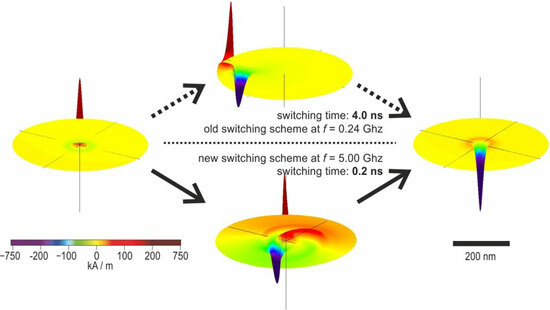 When switched more slowly with frequencies in the megahertz range, as was the case with the mechanism discovered five years ago, on the other hand, it had to be moved far from its equilibrium position; this meant that a storage bit required more space. The new mechanism thus makes further miniaturisation possible if data storage media which operate according to this principle are to be developed in the future.